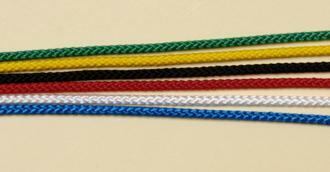 KJK Cords - ropes and fittings in a wide selection of sizes and colours. Red, yellow, white, black, orange, green or purple. Red, blue, emerald green, yellow, white or black. Red, blue, white, yellow, emerald green or black. 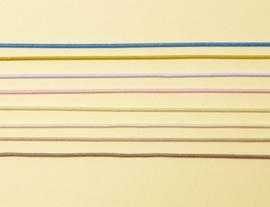 Putty, white, yellow, sahar, dusty pink, sandlewood, dawn, terracotta, light blue, light grey. 2.7mm dia. Light blue, white or brown. 3mm dia. MOD olive green. 4mm dia. MOD olive green only. 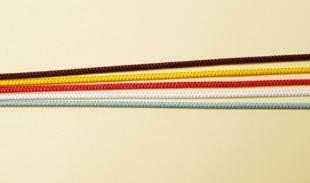 3mm 8 PLAIT CORD Looks traditional (sandy colour) made from polyester yarn. 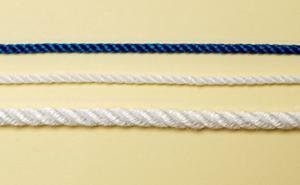 3 STRAND ROPE Matt polyester or shiny multi-filament. Ideal for knot boards etc. 4mm dia. 38p mt. 15g per mt. 6mm dia. 82p mt. 25g per mt. Matt 4mm - White, red, black, blue, natural (or shiny white). 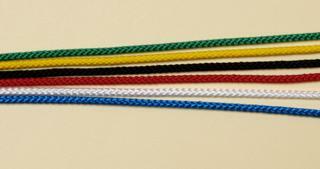 Matt 6mm - White, red, black, blue, natural (sandy brown) or Red, white & blue twist. Shiny 6mm - White or blue.